On behalf of my brother, husband and I, let me say that we felt reassured about the language of the lease after having spoken with you at length. Hopefully we will never have to litigate but at least we understand the terms and obligations of both parties to the agreement. It was a pleasure to work with you and Marceea. You were both very responsive to our questions and helped guide me through the process. As a Wyoming County gas lease owner I was overwhelmed by the “rumor factory” on gas wells, drilling, production units, pipelines, and royalties. Everyone I spoke to gave me different information and advice. The Clark Law Firm was recommended to me by my estate attorney. Talking with Doug was very informative and helpful. He answered all of my questions and is extremely knowledgeable and informed on all aspects of the gas industry. I will not sign another gas related document without Doug reviewing it first. 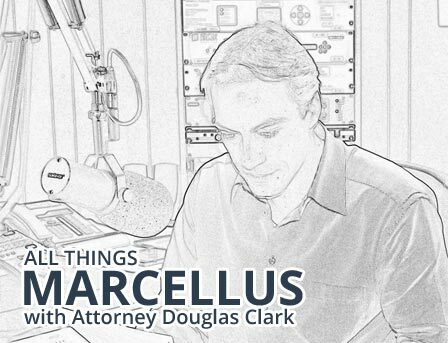 I highly recommend The Clark Law Firm to everyone who holds a gas lease in the Marcellus Shale. As a Sullivan County land owner I was unsure where to turn to get legal advice regarding a Carrizo gas lease for our property. I found The Clark Law Firm on the internet and after a preliminary conversation set-up a lease review call with Doug Clark. During the call Doug went over all of the pros and cons of the lease agreement and offered advice on adding an invaluable addendum to the lease that would protect the physical integrity of our property. Doug spent well more than the allotted hour talking with me and told me to call him with additional questions that would result in no additional charges to myself. I highly recommend the Clark Law Firm if you are considering a gas lease review. As a landowner in Wilmot and Terry Township in Bradford County, I signed a gas lease after having two different Attorneys look at it, what a mistake! Later on I joined the RLSTORE.COM web site, and with a lot of information on there I noticed the Clark Law Firm. I knew I would need an attorney sometime in the future. Last year I was contacted about putting a pipeline on my property, I called the office and spoke with Marceea, she was very pleasant, helpful and considerate. I talked with Doug next, and got the same response. Most recently I scheduled a consultation call with Doug and was completely satisfied, he took his time with me, answered all my questions and was very helpful with my concern's and issues. If I knew of Doug before signing of my lease, some changes would have been made. I would highly recommend the Clark Firm to anyone. As a diverse group of cousins from multiple states we were confronted with the problem of how to solve an oil and gas lease inheritance issue without traveling thousands of miles. We consider ourselves extremely fortunate to have found The Clark Law Firm. We received prompt, courteous attention. We were able to hold 3 way phone conferences. All of our questions were answered in a timely fashion. The billing was shared in a private, easy format. We never had to leave home. In short, we couldn't be happier with Doug's gracious, knowledgeable representation. Just a quick note to let you know how pleased we were with our visit to your office yesterday. We enjoyed meeting everyone and you put us at ease immediately. Everyone in your office is someone we can relate to. Doug the information you gave us reassures us that we are on the right track. It makes us feel secure to know that we have allies in our corner as we go forward through this maze!! We can't thank you enough for being there and learning all that you can about the Marcellus to help people like us! Once again we are so pleased with your office and will recommend you to everyone that we meet! Douglas Clark had been my gas lease attorney and when it became apparent that I would be involved in a pipeline Right of Way Agreement and require legal advice I had no doubt who would best represent my interests. Mr. Clark had done a wonderful job with my gas lease and now has also worked to obtain the best possible pipeline agreement for me. He is knowledgeable in pipeline construction and developed a good working relationship with my pipeline representative. Mr. Clark negotiated to attain the individual addendums which were important to me and for the protection of my property as well as to cover the other legal protections that comprise a strong ROW agreement. I highly recommend Mr. Clark as a skilled attorney who will work hard to assist landowners in obtaining a solid and individualized Right of Way Agreement.